I’m excited to be able to say that Shawn Wilhite and my Apostolic Fathers Greek Reader: Complete Edition is now available for pre-order. It’s available in paperback and hardback formats, and contains all five volumes in one. If you have the previous 4 volumes (vol. 1, vol. 2, vol. 3, and vol. 4) and have been waiting for the release of the 5th and final volume, that is also now available: The Shepherd of Hermas (Apostolic Fathers Greek Reader). I hope these volumes will be an aid to those looking to expand their competency in Koine Greek and in the history, teachings, and doctrines of the early church. Since this project has been a major undertaking and has gone through a number of iterations there are bound to be errors and typos. Feel free to send any when and if they are found to me at jacobncerone[at]gmail[dot]com. I will keep a record of them and implement them in the even there ever is a second edition. The Apostolic Fathers Greek Readers series assists students of Greek in reading non-biblical Koine Greek. In this volume, readers will engage the Greek texts of Polycarp’s Epistle to the Philippians, The Martyrdom Polycarp, Papias, and Diognetus. Vocabulary words occurring less than 30 times in the Greek New Testament are provided to help students quickly read the text and focus on its syntax. This work also includes an introduction and a select bibliography that orients readers to the settings and theologies of each work. Together, these elements make this Greek reader an ideal resource for students of early Christianity. If you’re looking to expand your knowledge of Greek beyond the New Testament, I strongly recommend you pick up this volume along with the other three volumes in the series (Vol. 1: Letters of Ignatius, Vol. 2 Didache and Barnabas, and Vol. 4: 1 and 2 Clement). And if this isn’t enough Greek literature for you, work is currently being done on the final volume, which will have Shepherd of Hermas. The Apostolic Fathers Greek Readers series assists students of Greek in reading non-biblical Koine Greek. In this volume, readers will engage the Greek text of 1 & 2 Clement. Vocabulary words occurring less than 30 times in the Greek New Testament are provided to help students quickly read the text and focus on its syntax. This work also includes an introduction and a select bibliography that orients readers to the life, setting, and theology of Clement. The bulk of the book focuses on the annotated Greek texts of 1 Clement (Jacob Cerone) and 2 Clement (Jason Andersen). Together, these elements make this Greek reader an ideal resource for students of early Christianity. 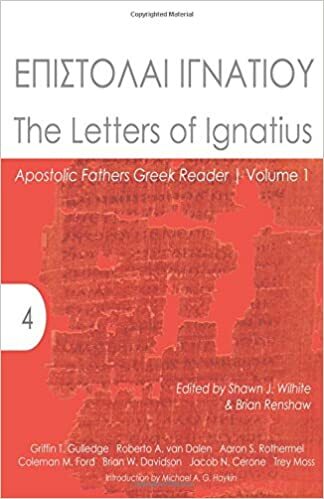 If you’re looking to expand your knowledge of Greek beyond the New Testament, I strongly recommend you pick up this volume along with the previous two (Letters of Ignatius and Didache and Barnabas). And if this isn’t enough Greek literature for you, work is currently being done on the Polycarp, Diognetus, and Papias volume (as well as the final volume which will have Shepherd of Hermas). Are there significant differences between the first edition of the New International Dictionary of New Testament Theology edited by Colin Brown and the revision by Moisés Silva? In doing some preliminary study of δεσπότης, I’ve pulled up various theological dictionaries and decided to see if there are any significant developments or changes within the newest revision of NIDNT. OT despotēs occurs only about 60 times in the LXX. Where there is a Heb. original it mostly translates ’āḏôn, lord, master. The word is used less than kyrios. This was no doubt because despotēs expresses the arbitrary, unlimited exercise of power without any real conditions, which must have been foreign to Israel’s concept of God. For Israel had experienced the Lordship of God in his gracious, saving actions in history. . . . The retreat of the term despotēs in the face of kyrios is theologically significant. This is a rather sweeping statement that has significant implications for theology or, rather, is highly influenced by a specific theological orientation. Bientenhard is not the only one that draws these conclusions about the word’s usage within the Greek OT, however. As a matter of fact, he has most likely gotten the idea from TDNT and has simply reworked it for this volume (see Rengstorf’s comments in TDNT 2:44–49). The infreq. of δεσπότης in the canonical books may reflect a concern that this term expresses an arbitrary, unrestrained exercise of power, something foreign to Israel’s concept of God (cf. K. H. Rengstorf in TDNT 2:47). This consideration, however, fails to explain why the term is seldom used of human beings as well. Moreover, the fact that it is used at all with ref. to God (incl. many instances in the Apoc., e.g., 2 Macc 5:20; 3 Macc 2:2; Wis 6:7; Sir 23:1) suggests that Gk.-speaking Jews did not regard δεσπότης as a negative term. Because the word is used with greater relative freq. in the Apoc., Rengstorf states that “the term is not really at home in the biblical world and only comes to be more closely linked with it as the years pass” (TDNT 2:46), but it must be remembered that many of the OT books were transl. from Heb. into Gk. in the 2nd and 1st centuries BC, i.e., about the same time as the books of the Apoc. were produced. Perhaps a better explanation is the simple fact that the Heb. language does not have a close equivalent to δεσπότης. Once the obvious correspondence between ָאדוֹן and κύριος had been established, no other Heb. term would have motivated the translators to use δεσπότης. In view of contemporaneous or even later Hellenistic Jewish writings, Silva’s corrective here is of great importance. One particular author I have recently read has taken up the idea from Rengstorf that the use of δεσπότης for God is a more remote, abstract concept that, while present within the biblical texts is not really at home in them. As we read later Hellenized, Jewish authors, we see a more Hellenistic picture of God, one that depicts him as an abstract power that is not intimately involved within human affairs or the course of history. While it is not my intent to challenge the idea of Hellenization or even the idea that the word became more acceptable as a title for the Jewish (and Christian) God, it is important to not base that idea on faulty assumptions. As a closing remark, I remind those working in the original languages not to be overly reliant on secondary literature. Even Silva’s revision must be tested and evaluated in light of the primary source evidence, to which I now return. I found Deissmann’s comments in Light from the Ancient East concerning the differences between and epistle and a letter to be very insightful. This quote is taken within the context of a discussion of the non-literary papyri that contains a host of non-literary letters versus the genre of epistle, which takes on the form of a letter but is written not between two individuals within the context of a private exchange, but rather is written for the general public and possesses artistic qualities. What is an epistle? An epistle is an artistic literary form, a species of literature, just like the dialogue, the oration, or the drama. It has nothing in common with the letter except its form; apart from that one might venture the paradox that the epistle is the opposite of a real letter. The contents of an epistle are intended for publicity—they aim at interesting “the public.” If the letter is a secret, the epistle is cried in the market; every one may read it, and is expected to read it: the more readers it obtains, the better its purpose will be fulfilled. The main feature of the letter, viz. the address and the detail peculiar to the letter, becomes in the epistle mere external ornament, intended to keep up the illusion of “epistolary” form. Most letters are, partly at least, unintelligible unless we know the addressees and the situation of the sender. Most epistles are intelligible even without our knowing the supposed addressee and the author. To attempt to fathom the soul of a letter-writer is always venturesome; to understand what an epistolographer has written is apprentice-work by comparison. The epistle differs from a letter as the dialogue from a conversation, as the historical drama does from history, as the carefully turned funeral oration does from the halting words of consolation spoken by a father to his motherless child—as art differs from nature. The letter is a piece of life, the epistle is a product of literary art. Adolf Deissmann and Lionel Richard Mortimer Strachan, Light from the Ancient East the New Testament Illustrated by Recently Discovered Texts of the Graeco-Roman World (London: Hodder & Stoughton, 1910), 220–221. Lately, I have been translating a lot of German. I have a number of tools that I use when trying to understand tricky passages or unfamiliar vocabulary. You might think that discovering the meaning of a German word used within biblical studies would be as easy as searching an online German-English dictionary. And in many instances you’d be right. For instance, http://www.linguee.com is an indispensable tool that I regularly use. But, it doesn’t have close to everything. That’s when I look for help elsewhere. And my Logos library, which includes a good number of German and English resources, is a big help. Searching my entire library for the word I’m struggling to define often produces results in the footnote of an English commentary that proceeds to talk about that term. If the definition isn’t outright given within the discussion, the context helps to make things clearer. Other times, however, the search will produce a result in the Theologisches Wörterbuch zum Alten Testament, better known in the English-speaking world as the Theological Dictionary of the Old Testament. Having these volumes in both English and German means I have a massive work that functions much like a diglot. Nach seiner Interpretation der Grabungsbefunde ist die Anlage von Qumran insgesamt das Zentrum einer hochgradig organisierten religiösen ‚Sekte‘, der Essener, deren Mitglieder nicht nur dort, sondern auch verstreut in der Umgebung lebten und in der Anlage zu gemeinschaftlichen Begängnissen zusammenkamen, in den Werkstätten in Qumran oder der Landwirtschaft in ῾Ein Feshkha arbeiteten und schließlich auf den sehr großen Friedhöfen begraben wurden. Clicking on the word opened the resource to the right page. Then opening TDOT from my library took me to the correct article. All I needed to do from here was navigate to the proper section in TDOT to discover that the translator uses the word “procedures” for Begängnissen. Repeating this process for the second result, I found that the phrase “kultischen Begängnissen” was translated as “cultic rites,” an expression that correlates nicely to the “cultic” or “sectarian” environment addressed in the passage I’m translating. While neither of the uses of the word in these results dictates that it will be the same usage/nuance in my passage, it gives me a much better idea of the word’s meaning and allows me to make a better decision about how to translate it. Since I have been doing a considerable amount of translation lately, I thought it was time to start working on a toolkit of my own in the fashion of the Wayne Coppins’ German-English Dictionary. As I have been translating, I have encountered a number of technical terms or compound words that aren’t in any of the German-English dictionaries I have and aren’t in any of the online German-English dictionaries either. To help me in my future translation and perhaps others that translate on a regular basis or need help reading through a work, I have provided the terms with the best English approximation I have come up with. I’ve also included some notes, a broader context of the word’s usage, the source of the quote, and—where necessary—a citation of whomever may have helped me provide a definition for the term when I was unable to come up with a solution myself. Although I only have about 30 terms in the spreadsheet at the moment, I hope to add to it on a daily/weekly basis. I only wish I had started earlier. You can access the dictionary HERE. Feel free to contact me if you would like to add entries yourself and I will enable the spreadsheet for editing instead of just viewing.